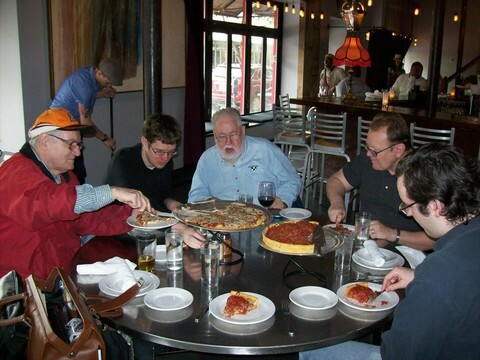 On April 23rd, 2011, six of us from the club went down for the second year running to watch a day of the U.S. Championships in person. It was a greyish, somewhat rainy Saturday at first. 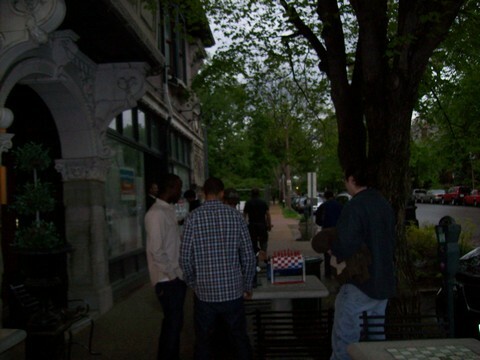 We gathered at the club at 8:30 to head down to the Gateway City. 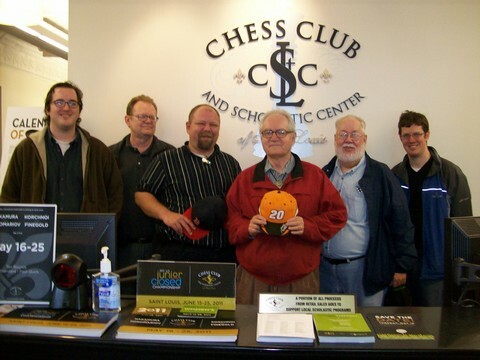 A 3 hour car ride later and we find ourselves at the Chess Club and Scholastic Center of St. Louis. We're not in Kansas anymore... OK, we were never in Kansas, but we're definitely at the CCSCSL. Not sure what this is, but some of our members found out! We went inside and paid the day fee. 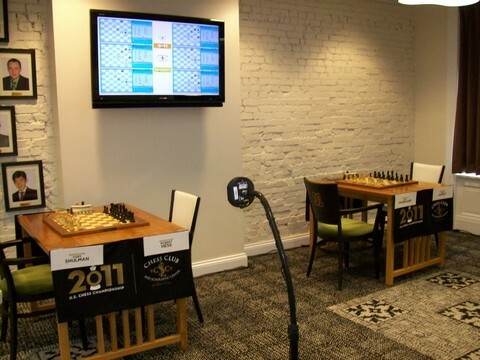 The hospitality of the CCSCSL has to be experienced to be communicated. We took some time to look around as things were being set up. I took the time to go up to the playing floor and look at where the play would occur. Ready for a fierce contest to begin! 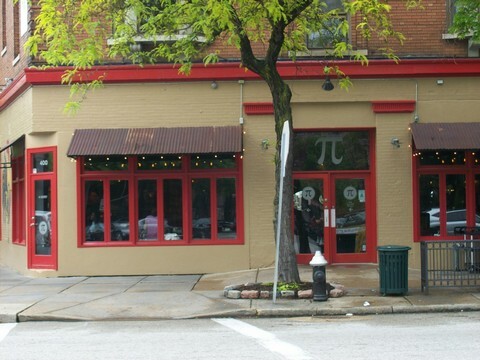 Then it was off to lunch at the Pi Pizzeria. A yummy and hearty lunch is essential for chess spectating! 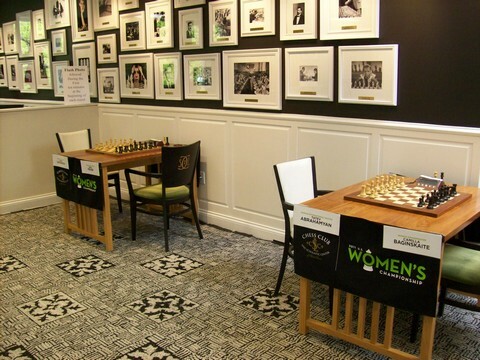 Back to the Chess Center, where round one of the Semifinals was already underway. (Unfortunately, we arrived two minutes late for taking pictures of the players at their boards.) 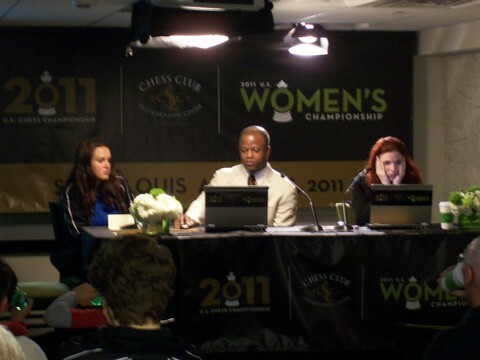 So it was downstairs to the analysis room where Maurice Ashley and Jennifer Shahade were already commenting on the action. 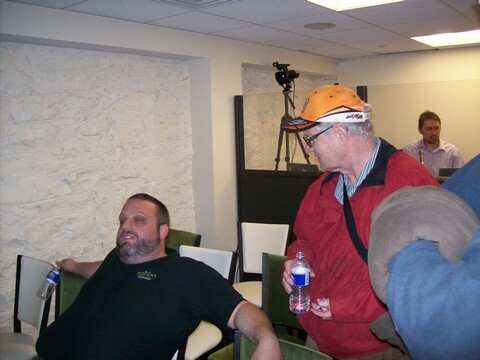 Dennis and Michael observe the commentary. 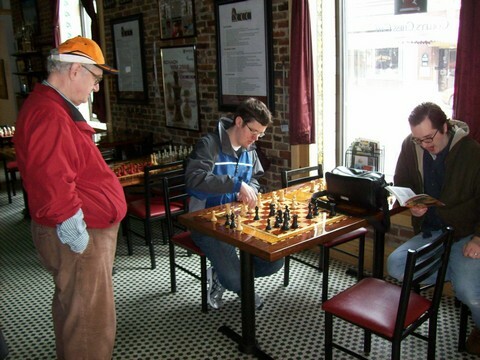 The players already had their opening books set, and most of the games had already reached to around move 10. Shall we Play an (actual) Game? 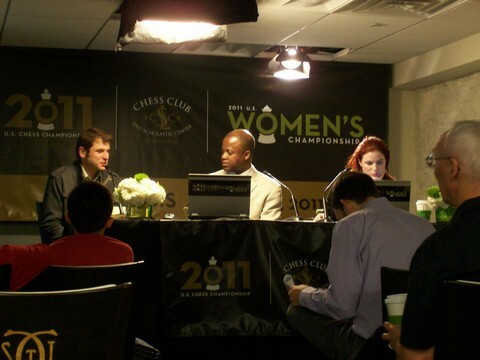 GM Yury Shulman just after play. IM Sam Shankland right after play. 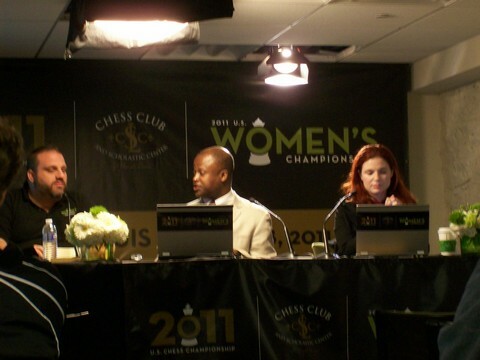 IM Anna Zatonskih comments on her victory. 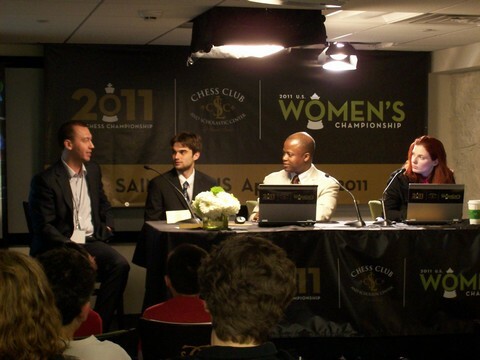 GM Gata Kamsky and GM Robert Hess discuss their draw. 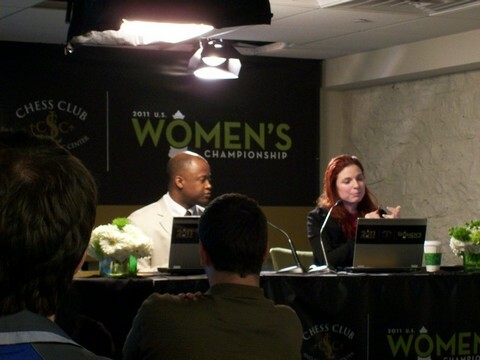 WGM Camilla Baginskaite comments on her win. Michael Boyle gets a last game in. 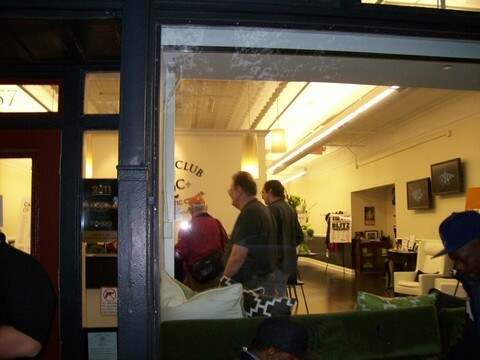 Dennis and Chris make some last purchases while Joe looks on. The sad part - time to go! 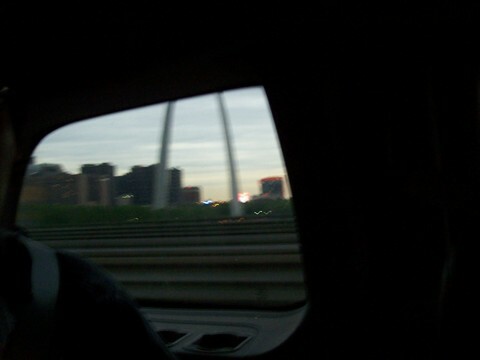 And then we were in the car heading back to Bloomington. 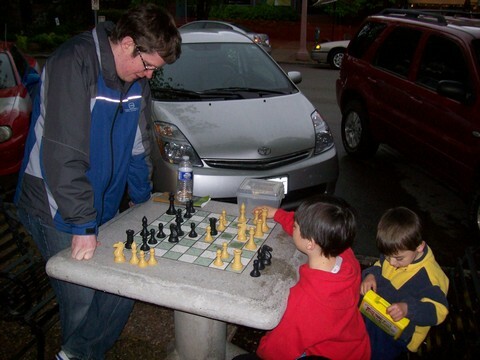 The happy part: Garrett Scott drives us to our next Chess Adventure! Thank you St. Louis and the CCSCSL! See you again! 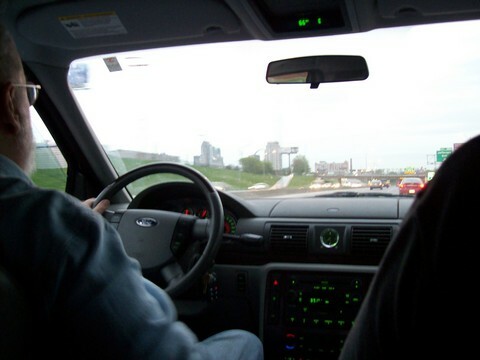 This entry was posted on Sunday, April 24th, 2011 at 3:54 pm	and is filed under Photos. You can follow any responses to this entry through the RSS 2.0 feed. Both comments and pings are currently closed. 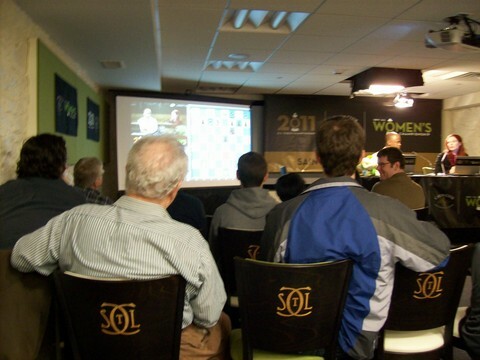 The St. Louis Chess Club has an outstanding selection of books and videos. 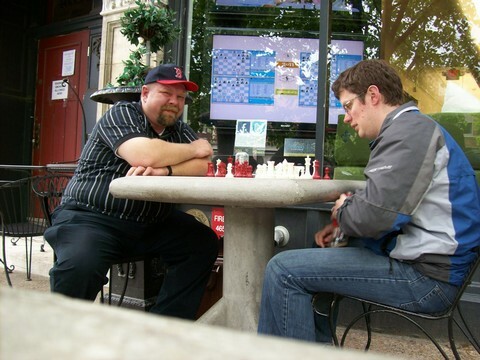 I have been there twice and each time there I got the best chess book that I purchased that year. Plus, how many chess clubs have fresh flowers in the bathrooms? Going with friends made for an outstanding experience. 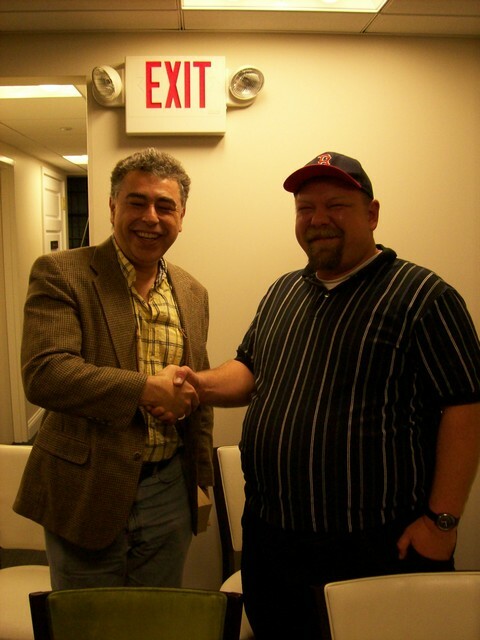 Just a personal note—I played in the U. S. Open in 1975 in Lincoln, Nebraska and Yasser Seirawan was 15 years old and also participated. 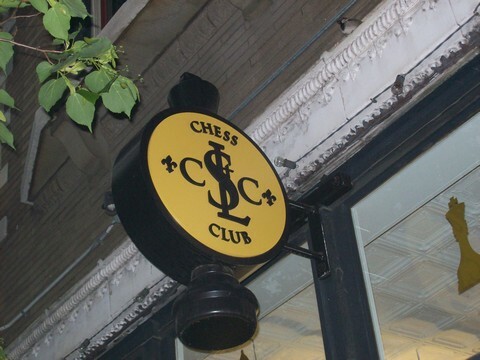 Yasser finished close to the top—(Pal Benko might have taken first place)— I think that that tounament was Yasser’s first high finish in a national tournament and brought him to U. S. Chess prominence. 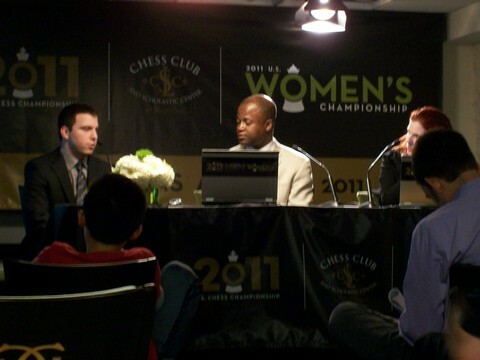 Joel Benjamin also played in that tournament—he was 9 years old and had a rating of around 1950. I had an even score. 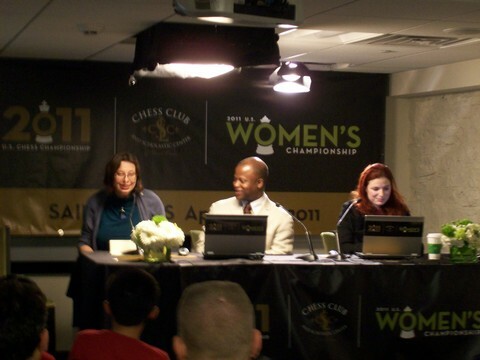 Yes, in the 1975 U. S. Open Yasser Seirawan (then 15) and Joel Benjamin (then 9) participated. Pal Benko and William Lombardy won that year. 10 years later, (1985) the U. S. Open co-winners were Yasser Seirawan, Joel Benjamin and Boris Spassky.